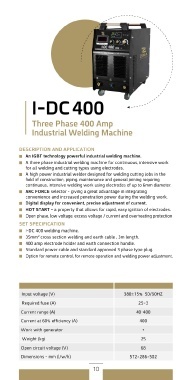 for all welding and cutting types using electrodes. continuous, intensive welding work using electrodes of up to 6mm diameter. convenience and increased penetration power during the welding work. HOT START – a property that allows for rapid, easy ignition of electrodes. 35mm2 cross section welding and earth cable , 3m length. 400 amp electrode holder and earth connection handle. Standard power cable and standard approved 3 phase type plug.